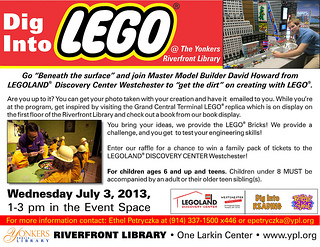 On July 3 from 1-3 pm, you can meet Master Model builder David Howard from Legoland Discovery Center, build a crazy Lego challenge, have your photo taken with it and have it emailed to you. You can also check out the very cool Grand Central Terminal Lego replica which will be on display at at the Library, and check out some of the cool Lego books the Library has to offer. For children ages 6 and up. Children under 8 must be accompanied by an adult or an older teen sibling. At the Riverfront Public Library, One Larkin Center.